Following the €1.2 million Galileo filly that led Day 1 trade, it was a son of Frankel that took top billing on the final day of the Goffs Orby Sale when the brother to two Group winners from Eddie Irwin’s Marlhill House Stud (Lot 330) was purchased by agent Justin Casse on behalf of Zayat Stables for €1.6 million. 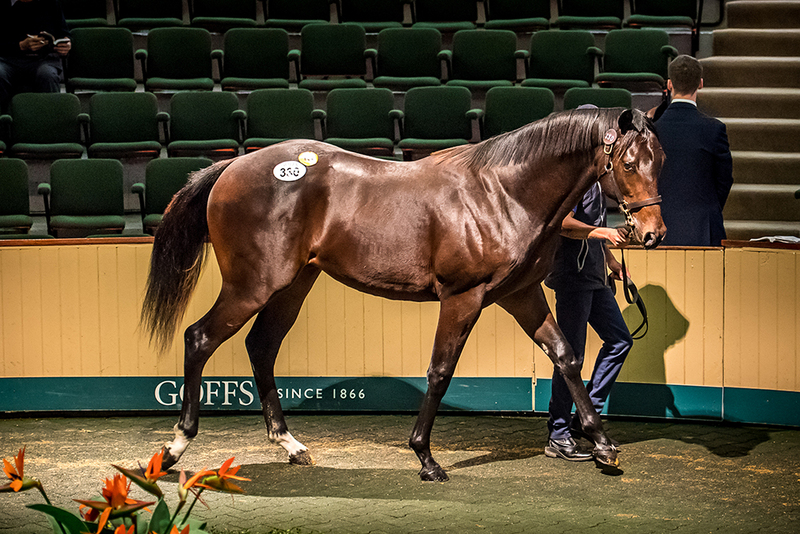 International competition was fierce throughout an action packed day in the sales ring, with other stand out lots including the Kingman colt out of an own sister to champion filly Immortal Verse (Lot 444). Consigned by Baroda & Colbinstown Studs, he sold to Roger Varian for €650,000. Another highlight followed shortly after when a beautifully bred Galileo filly from Barronstown Stud (Lot 455) was sold to Mayfair Speculators for €625,000. Edie Murray-Hayden of Gormanstown Stud provided one of the great success stories of the sale with her yearling colt by Dabirsim (Lot 364), a €56,000 purchase as a foal last November at Goffs, selling for €500,000 to SackvilleDonald. BBA Ireland was the leading buyer across the two days with a remarkable 41 yearlings purchased, headed yesterday by the Galileo half-sister to Hazel Lavery (Lot 156) purchased for €380,000. Full results and statistics for the Orby Sale are available here. “Two millionaires by Galileo and Frankel were the clear highlights of another strong renewal of our flagship Orby Sale which has been well supported by a huge international cast of buyers who flocked to Co Kildare to buy some beautifully bred world class yearlings that had been sent to us by leading breeders. With the likes of Ribchester to promote our wares – and you can’t do much better than have the world’s best horse sold at a European auction – we were hopeful of a big attendance and I think it was revealing that the only complaint we received on Saturday was that a vendor was “too busy”! That demonstrated a real desire for Orby yearlings and led to a sustained demand for the very best over the two days with two millionaires versus one and more lots realizing over €250,000. Indeed Orby is all about the bestselling very well and it was perhaps the case that those few that did not live up to that billing were less popular. The fact is that Orby is very much a premier European sale and that is what our huge cast of buyers require at this sale so they will overlook any that do not fulfill that strict criteria. There is certainly some food for thought when autumn turns to winter but it is very clear that Orby competes with any sale at the top of the market as we saw on so many occasions with titanic six figure bidding battles very much the norm on both days. Of course last year the sale was boosted by a group of yearlings that formed part of the once in a generation Wildenstein Stables Ltd Dispersal and it is gratifying that we have bettered the sale when you take out those one-offs whilst an improved clearance rate of 86% is very much a positive. As ever we are indebted to our vendors, several of whom continue to send us a larger share of their very best, and we wish each purchaser the very best of luck with their Orby yearlings”.